Faber & Faber cover from Wikipedia. I studied Lord of the Flies at school in year nine for my English Literature SATs exams. At the the time, my classmates and I had no idea we were reading a book that was so controversial. If we did, perhaps there would have been greater enthusiasm. The book was written in 1954 by English author, William Golding, who was inspired by R. M. Ballantyne's nineteenth century novel, The Coral Island, which was about three boys marooned on a South Pacific island, and a popular text for primary school children. Golding therefore appears to follow on in this tradition. He expanded the cast of characters, as well as the overall theme of human nature, focusing on civilised behaviour versus primal instinct. Lord of the Flies is set during an unspecified nuclear war. A group of school and choirboys are being evacuated, when their plane crashes on a deserted island. The children try to construct a civilised society in order to survive, but there is a power struggle. On one side is Ralph, a school boy who assembles everyone together by blowing on a conch shell. The conch shell is an important object in the book, symbolising order and cooperation. On the other side is Jack, the lead choirboy. One might expect the choir boys to be the more genteel of the group, following the word of god, looking towards him for guidance in time of need. But Jack is ruthless, savage, and does not tolerate weakness or anyone who disagrees with him. 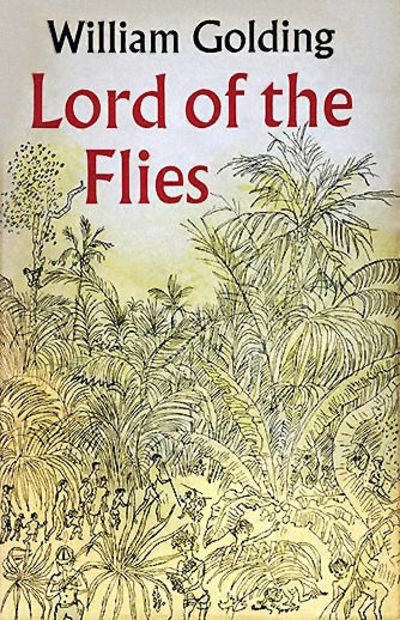 Lord of the Flies went from being an unpopular book when it was first published, (selling merely three thousand copies in the US before going out of print) to a bestseller in the 1960s. It soon hit the school curriculum, but just one decade later trouble started brewing. Between 1974 - 2000, eight educational establishments challenged its presence. Reasons for objection included violence, bad language, sexual innuendo, racism, and attacks on religion, and the disabled. You'll note that all of these took place in either the US or Canada, and not in its country of origin. Is this because the English are willing to tolerate such things? I don't think so. In my opinion, any bans are the result of ignorance, overreaction, or overzealous views. Just because a book features violence or discrimination does not mean the author condones it. It is clear the William Golding is making a critical observation of human behaviour. We may be civilised when we are well fed and have everyday comforts, but when those are taken away from us, we return to our primal roots. Survival of the fittest. Lord of the Flies should be read by all. It is not only fantastic book to study from a sociological point of view, but is also engaging and enjoyable. There's excitement, adventure, danger, and recognisable characters that you can relate to. Studied this for Debating in Grades XI-XII. Loved it, as was fascinated how quickly 'learnt society' broke down, when boys' had to fend for themselves. It's one 'set' book, like the Hardy novels, I also studied & REALLY enjoyed, & have re-read over the years' since. Another author I keep re-reading is R.F. Delderfield, with his 'To Serve Them All My Days', & 'A Horseman Riding By', more faves of mine. Have the DVD's of all the above, as well!